Killer Characters: Of Ice Machines and a Giveaway! Of Ice Machines and a Giveaway! As the keeper of the purse for the Read ’Em and Eat Café and Bookshop, I assured Bridgy, who, as you know, is my business partner, that I did understand we would be in massive trouble if the ice machine died completely. Fort Myers Beach is in South Florida and it does get mega hot. But I kept hoping we could stretch the life cycle of our clunky, unreliable ice machine into the next fiscal year. Bridgy was totally focused on being forced to serve tepid sweet tea, soft drinks and lemonade to our customers if the current machine went completely on the fritz. Fortunately Miguel, the café’s primo chef, sat us down with big bowls of ice cream and we ultimately came to a settlement. By settlement, I mean Bridgy won and we purchased a brand spanking new ice machine. If you haven’t yet followed along with the ice machine adventure, or tried to figure out who murdered a not-so-nice volunteer at the local library, here is your chance. 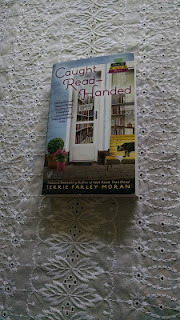 We are giving away a copy of Caught Read-Handed to one lucky commenter below. Just mention your favorite drink that tastes better with ice. Don’t forget to include your email addy in this format: name(AT)server(DOT) com to avoid the spam bots. Giveaway closes at midnight Wednesday, September 21st. And here is a note from our author: FYI: On Amazon Read to Death is reduced to $6.47, and Well Read, Then Dead is reduced to $7.43. No reduction on Caught Read-Handed but I have never figured out how pricing is done so I am not surprised. Good morning everyone!! I'm a little spacey from spending the past week in New Orleans at Bouchercon, a fabulous mystery convention. Today I am home but feel as though I will never get my day organized. Small price to pay for hanging out with the mystery crowd. Go readers!! Go writers!! It's also "talk like a pirate" day today. I love Bailey's over crushed ice. I drink plain old iced water. Iced coffee! My favorite drink with ice. Thank you for the opportunity! Sorry. I like coke or OJ over ice. Iced Tea and crushed ice is the very best...I like it lightly sweetened and it is yum when it is fixed right...yep I am from the South...the Book sounds wonderful and I would love to read it. I like my half tea and half lemonade with crushed ice. Looking forward to reading "Caught Red Handed", this is a new series to me. Iced tea. kristilewis.lrc@gmail.com Would love to win this giveaway! All drinks that are suppose to be cold taste better with ice. My favorites are Dr. Pepper, Sweet Tea, and Water. My favorite drink is iced tea with lemon. Diet Coke with lots of cubes. I love ice water in a glass of crushed ice. After all the water is gone, then I like to chew on the ice. My favorite drink is coke with crushed ice!! Or root beer with ice! Cherry Limeade with that Sonic ice! Yum! No Sonic near where I live so when I find one its a lucky treat! Unsweetened pineapple juice is just delicious when icy cold. I love ice in me drink mate, whatever it is. Lemonade with lots of ice. Thanks for the chance to win this giveaway. I love crushed ice from a local hospital I worked at and we all cried when they were out of service! Ice cream beats all but I do love my sweet tea with ice. Love your books, argolk725atgmaildotcom. Have a great day. Bottled water tastes better with ice. Iced Peach Tea is one of my favorites. Suntea is Da bomb diggity! Ice Tea with LOTS of Ice. Sweeten of course. And sometimes a Bloody Mary. Yummy... Thats for the chance to win. I love Green tea with ice and orange zest! I like ice-cold Coke from the 8 oz. bottle over crushed ice! Yum! Caught Read-Handed looks really cool! I Love iced coffee, especially if it is iced coffee with a mocha creamer! Coke, pepsi and lemonade are all drinks that taste better with ice. dbahn(at)iw(dot)net. Sweet tea with lemon, nothing beats that on a hot (or cold, for that matter) day! I like ice tea with ice. DALubbert (at) hotmail (dot) com. And the winner is Carol Wong. Congratulations! !